The old man sat on the dusty ground, a pile of broken stones between his outstretched legs. All around him, tall piles of gravel cast stunted shadows from the noon day sun, silently waiting for a buyer with a wheelbarrow to come and haul them away. My wife crouched down, and asked the man his name and how long he had worked at the quarry. In his slow, heavily-accented English, he said that his name was Joseph, the same as mine, and he’d worked here for the last nine years, breaking apart rocks with a small hammer. He was sixty-five, an age at which many of us hope to retire, and he looked as tired and worn out as the frayed clothes he wore. Still, he spoke with a smile, and his eyes gleamed as he passed his hammer to my wife, so she could have a try at breaking the stones. 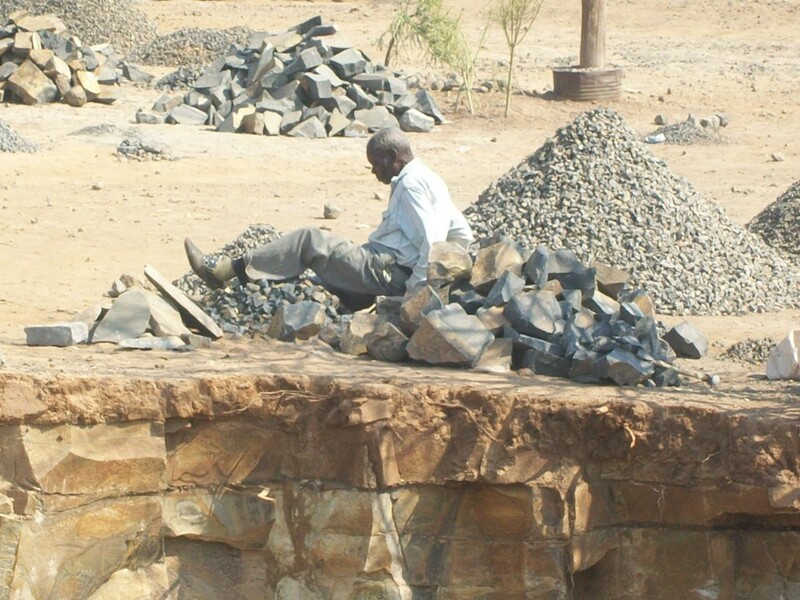 This was Livingstone Quarry, on the outskirts of Livingstone, Zambia, a town best known in the Western world for its proximity to Victoria Falls. Few tourists came here though, just poor Zambians, hoping to make enough money to survive by tearing rocks from the ground, breaking them into gravel, and selling the gravel to builders for $1 per wheelbarrow load. I gazed around the shattered landscape, marvelling at a world I had never seen before, never really imagined. Down below, a man with a sledge hammer pounded against a rock wall, breaking stones free. 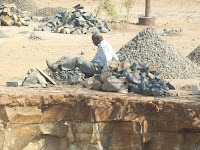 Then he grabbed the large stones and hurled them twenty feet above his head, up onto the lip of the quarry pit. Nearby, a group of children carried a larger cooler amongst the workers, selling individual ice-cubes as a source of refreshment. My wife thanked Joseph for his time, and we walked on. The workers glanced at us with little curiosity, a pair of ‘rich’ tourists, invading their place of work. 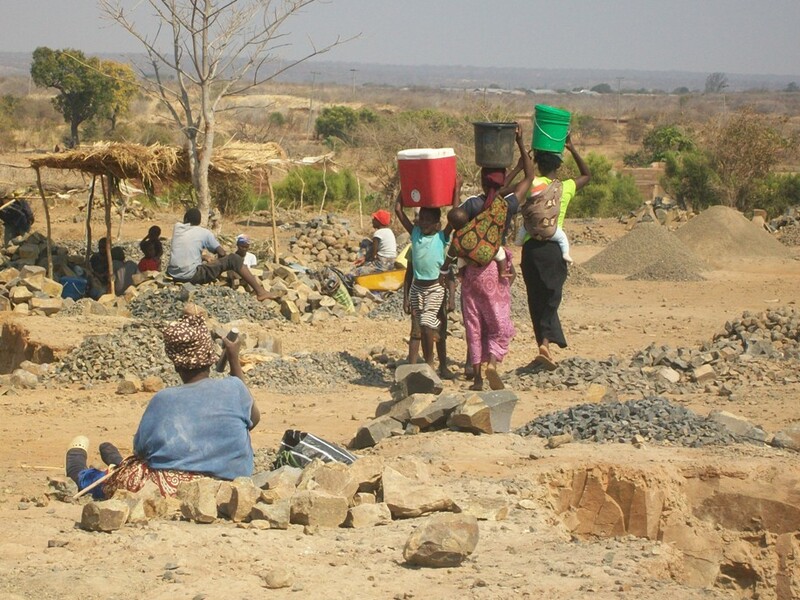 In the distance we could see the tractors and machines of the newly opened private quarry that threatened to steal what little money these people could earn. Close by, two teenage boys, possibly brothers, banged away at their own pile of rocks. Perhaps they were helping their families, trying to earn money during the school holidays, maybe they needed the money to pay for school, or maybe school was just a dream for them, and this was the beginning of their working life. I didn’t have the courage to ask. As we turned to leave the quarry, we passed a middle-aged woman in a flower-printed dress, sitting on the ground, singing happily to herself as she smashed stones with a heavy, iron weight. ‘That’s a lovely song,’ my wife said. The woman smiled up at us, as she pulverized another rock. ‘I love my job’, she said. For over a dozen years, Big Finish Productions has been producing Doctor Who audio plays. Engaging the help of all of the living actors to play the Doctor from the original series, they have created over two hundred new adventures for the Doctor and his companions. In my opinion, these plays have been the highest quality Doctor Who ever produced. With their complicated, adult plots, unbound by the need for expensive visual effects, these stories have taken the Doctor on some truly fantastic adventures. I really can’t recommend Big Finish highly enough. Unfortunately, the latest title I’ve added to my collection doesn’t merit the same level of praise. 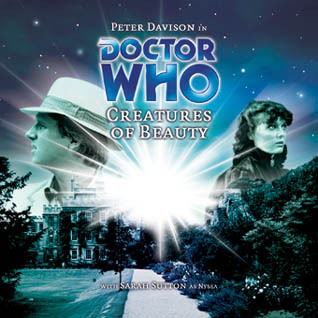 Doctor Who 44: Creatures of Beauty stars Peter Davidson and Sarah Sutton, a team that has produced good work in the past, and there is nothing to fault their performances here. Instead, it is the script that lets everyone down. The story dives right into the action. Or, perhaps more accurately, the action dives right into the story. For the first ten or fifteen minutes, I really had no idea what was going on. I even wondered if I had perhaps put in the wrong CD by accident. Eventually, I realized that the story wasn’t being told in chronological order, instead the narrative was skipping around in time. This is not the first time I’ve encountered such a narrative device, and I’ve got to admit, it always makes me sceptical. There are (perhaps) legitimate reasons to tell a story in this fashion, but they are few and far between. Instead, I find that such a technique is usually employed to cover up a lack of plot, and that, I fear, is the case with Creatures of Beauty. If you actually laid out the plot of this play chronologically, it would quickly becomes apparent how little actually occurs. Even more damning, it would also become obvious that neither the Doctor, nor his companion, do anything of significance within the story. This is actually pointed out by the Doctor himself towards the end of the play, right before a meaningless and rather obvious twist, fails to save the story. While I will happily add this CD to my ever growing collection of Doctor Who audios, I highly doubt I will ever listen to it again. Despite what some guide books say, Livingstone, Zambia is not a tourist town. Sure, it has a few backpacker hostels, but these are basically self-contained units, that provide everything a traveller needs. Even then, a vast majority of tourists who come to Livingstone skip the town altogether and head ten kilometres down the road to the swanky hotels that line the banks of the Zambezi river near Victoria Falls. (Although these people are missing out on a lot, I don’t judge them too harshly. Culture shock would soon hit me like a sledgehammer, and shake my confidence as a traveller). 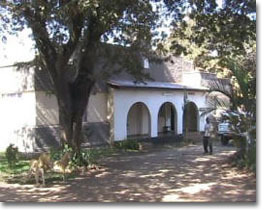 My wife and I, however, had chosen to stay at the Guest Mate Inn, which had been booked by my wife’s friend who lived in Livingstone. According to what little literature I could find on the place, it had once served as home to British Army officers back during the days of Empire. The walled compound consisted of the main house, with an opened walled bar at the back and five or six detached dwellings. One of these had been reserved for us. Upon check-in, we were told that we must pay for the room in advance. It was only then that we learned about the recent law forbidding the use of any currency except the local kwacha. Bad news for my pocket full of US Dollars. Thankfully, in true Zambian style, the woman behind the desk, just smiled and told me I could pay tomorrow, or the next day. 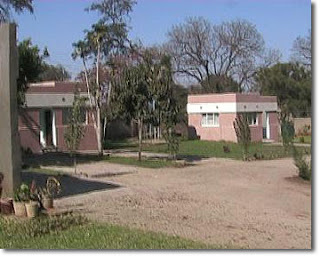 I did managed to pay the next day – 2,140,000 kwacha (about $400) for the nine-nights we stayed there. Our little dwelling consisted of a comfortable bedroom, containing a mini-fridge, an air-conditioner/heater, and a television that received three channels. We also had a bathroom, with a nice, hot shower. Although the room looked a little tired and worn, at the time, we didn’t realize what kind of luxury this represented. As near as we could tell, very few tourists stayed at the inn; its main clientele appeared to be passing businessmen. Our room also came with a complimentary ‘continental’ breakfast. This consisted of Roos tea and toast with butter and jam. The butter and jam came on a plate, four rough lumps of butter around the edges, with a plop of jam in the middle. A couple of mornings they were out of jam. Sometimes, the toast was only toasted on one-side. For $4 you could order a ‘Full English’ breakfast. We tried this once, and although they made a valiant effort at sausages, eggs, bacon, and baked beans, we decided to just stick with the toast from thereafter. In the nine nights we stayed at the Inn, our room was never cleaned. One morning, one of the women who worked their asked if ‘today we wanted our room cleaned’. Somewhat caught off-guard by the question, we replied that it wasn’t necessary. ‘Maybe tomorrow, then’, she replied, and that’s the last we heard of it. We did, once, have to ask for more toilet paper, and our bin was a bit overflowing by the end, but it was fine. Should you ever find yourself in Livingstone, and there are many reasons to go, consider staying a night or two at the Guest Mate Inn. Over the last couple of decades of miniature painting, I have tried out lots of different sizes and scale of miniatures, but I always come back to 28mm. Not only do I find it the most ascetically pleasing size of miniature, but also the most enjoyable to paint. That said, occasionally a ‘28mm’ miniature depicts something so large or so small, that it is essentially like painting a miniature in another scale. Such is the case with this week’s miniature. I can’t remember the official name of this miniature, but it comes from Reaper, and I purchased it at the Troll’s Cave in London. 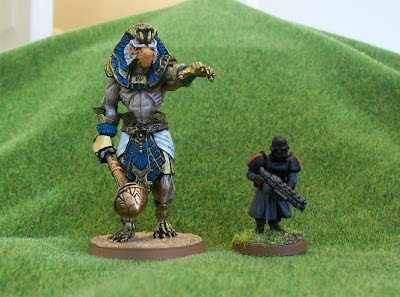 I have no specific need or use for it, but it caught my eye, and it will make a nice center piece should I ever do any kind of Egyptian warband. It actually sat on my lead pile for quite some time before I worked up the nerve to tackle it. Not only is such a large figure quite an undertaking, but it also requires slightly different painting techniques. Essentially, the larger a miniature gets, the more subtle the shading and blending of the colours needs to be in order to achieve a realistic finish. As most of my practice has been done on smaller miniatures, I wasn’t sure how I would cope with such a beast. I use a lot of black-lining in my miniatures, and it perhaps came out a little too harsh in some areas of this one, where it is separating light colours. Also, it would have been nice to get a subtler shading effect on the skin tone. Neither of things are as noticeable on the actual figure as they are in the photograph. Of course, neither is the nice subtle blending I managed on the beak. All and all, I’m pretty happy with how my Egyptian avatar turned out, and he looks pretty darn menacing looming over the puny ‘normal sized’ 28mm miniatures. This summer, my wife and I travelled to Livingstone, Zambia, partly as a vacation and partly so she could help the Book Bus charity on a new project working with local teachers on how to better utilize books in the classroom. I had never been to any part of Africa before, so, despite my broken collar bone, I was greatly looking forward to the trip. Our guest house can just been seen at the end of this road. After much debate, we decided to travel British Airways the whole way. We could have saved nearly £400 flying with other airlines, but BA have always proven dependable, and we didn’t want to take any unnecessary chances. Our flight from London to Johannesburg was long, but uneventful. On arrival, however, I got my first shock in Africa – it was cold! I mean, it was really cold. In fact, the day before, Johannesburg had actually seen its first snow flurries in more than a decade. Apart from a couple of stores selling colourful African knick-knacks, and a decent bookshop, there is not a lot going on at the Johannesburg airport, and we were happy to board our small plan to Livingstone. As we soared above the African plains, I looked out of the window and saw great plumes of smoke rising in several places, the result of large bushfires brought on by the dry conditions. We flew directly over Victoria Falls. The pilot even tilted the plane to either side to give us a better look, but from above, I was never quite sure what I was seeing. Finally, after about twenty hours of travel and waiting, we touched down in Livingstone, Zambia. At immigration, my wife and I were each charged $85 for a double-entry visa. I don’t begrudge the country its money, but there is something a bit odd about charging money in a currency that can no longer be legally used in the country (more on this in a later post). Outside of the airport, we were met by a smiling cab-driver holding a sign with our names on it, a welcome sight arranged by the woman who runs the Book Bus. Our cabby spoke to us in heavily accented English as we rolled out of the airport. At first, I was impressed by the quality of the roads and the infrastructure, but this was an illusion that quickly vanished. The Zambian government has obviously put a lot of resources into this initial impression to tourists, but the closer we got to the town of Livingstone, the more things started to fall apart, quite literally, in fact. The roads became worse, sometimes crumbling around the edges, sometimes bulging in the middle, as though squashed by giant trucks. The buildings, which dotted the road side, went from nice, to run-down, to dilapidated. Everything, good and bad, was covered in fine, orange dust. By the time we turned off the main road up the hill to our guest house, the road had nearly given up. The surface we drove up had once been paved, but appeared to have been smashed with the hammers of giants, leaving gaping, rubble-strewn holes, and jagged, crumbling edges. Even dodging the biggest holes, the taxi bounce up and down as though the road were a speed-bump testing zone. It was with the greatest relief to my pounding head, and aching arm, that we pulled into the dirt drive of the Guest Mate Inn.